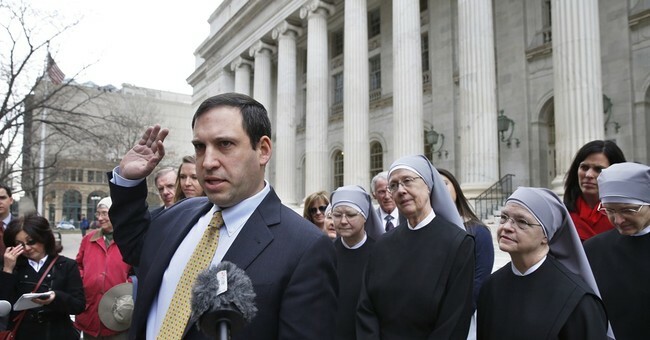 The Little Sisters of the Poor, represented by the Becket Fund for Religious Liberty, asked the 19th Circuit Court of Appeals Monday to prevent California and Pennsylvania in their attempt to roll back President Trump’s October 6th broadening of religious exemptions for groups, like the Little Sisters, with religious and moral objections to covering contraception. California Attorney General Xavier Becerra sued the Trump administration immediately following the new religious exemptions to the Obamacare contraceptive mandate. The lawsuit claimed the rule change was unconstitutional because it targets and harms women by denying their Fifth Amendment rights to equal protection under the law and that it allows employers to use their religious beliefs to discriminate against employees. "These States are specifically targeting religious groups. Pennsylvania has never required anyone to provide contraceptives,” Rienzi told reporters on a press call Tuesday. “Now Pennsylvania is claiming religious groups have to provide these services." "Legally there is no good argument for what these states are doing," he added. The nuns, who care for the elderly poor in the U.S., finally began to see some relief along with other nonprofit religious organizations that had been involved in a five-year long lawsuit against the Obama administration over the contraceptive mandate. Paying for or supporting the use of contraception is contrary to fundamental Catholic moral teaching. The Obama administration offered the groups an accommodation that would delegate the contraception coverage to a third party, but they objected that the process still left them complicit in the coverage. Their case was remanded to appeals courts with direction from the Supreme Court that the Obama administration and the organizations work out a compromise. Rienzi told reporters on the press call that that original lawsuit is still ongoing with the next update expected in mid-December. He added that the Supreme Court’s injunction in that case still applies which making it less likely that the states’ new lawsuits will succeed.